The Macks Creek FBLA and NHS routinely sponsor blood drives. Please check back for more information regarding the next drive hosted by the club right here at Macks Creek School. The Macks Creek chapter of the Future Business Leaders of America choose to support our troops as their service project by joining in the Adopt a Platoon program. 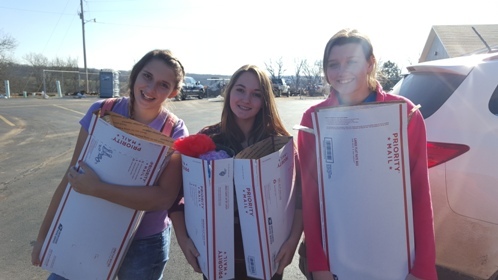 Members collected items to send to our assigned platoon stationed in Kuwait. With the help of Adam Ziegelbein of Thrivent Financial, FBLA was able to send six boxes of snacks and supplies to our troops in time for Christmas. FBLA hopes to be able to continue this project throughout the year and send another round of supplies before their deployment is over.